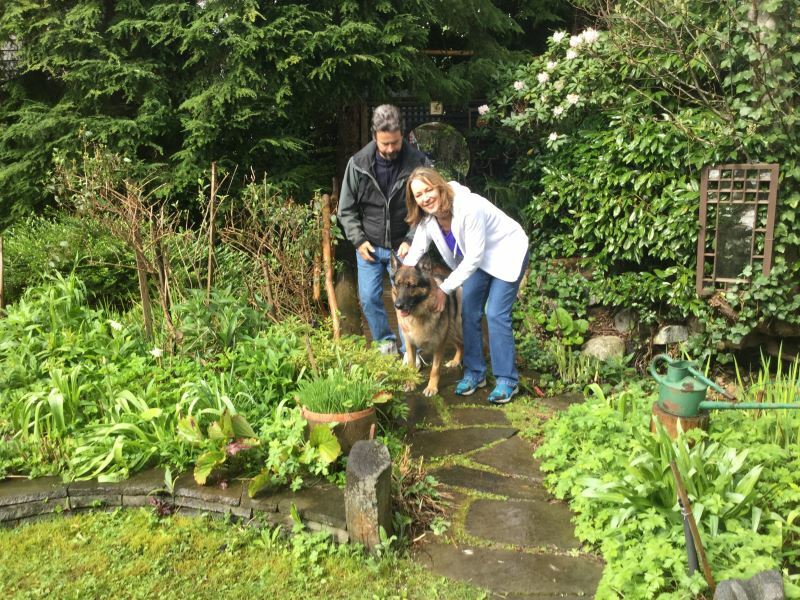 Animal Advocates of BC gets hundreds of appeals a year for help for an abused animal that the animal protection agency can't or won't help. Sometimes all we can do is offer advice and money for all bills should the dog be rescued – and we can offer a safe haven. 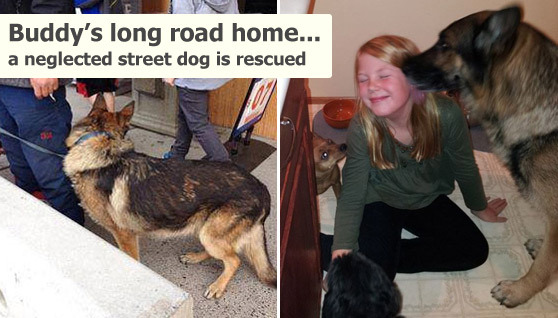 That is what we did for a cringing, skinny, dirty German Shepherd street dog named Buddy. 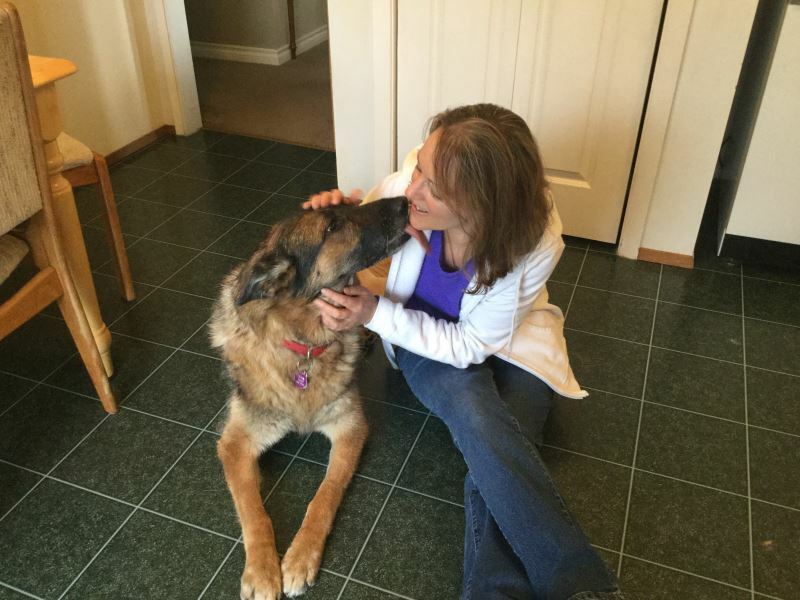 Animal Advocates was contacted by a number of women in Kamloops, in British Columbia's interior, who were terribly concerned about a street-person's German Shepherd dog whose spine and hip bones stood out alarmingly. Some of these women brought food and water for Buddy when they saw that he had none. But worse than hunger and thirst was how Buddy nervously cringed away from the man (who we will call A.T.D.). These women saw A.T.D. seemingly unconscious in bushes for long periods, with Buddy loyally lying by his side. A.T.D. 's appearance was frightening and his behaviour even more so. Many women in Kamloops, who worried that Buddy was being beaten as well as slowly starving, were desperate for help for him. Employees of the liquor store, a gas station, and a motel, wanted Buddy seized by the BC SPCA under BC's Prevention of Cruelty to Animals Act, for lack of food, water and shelter, and possibly for untreated injuries. 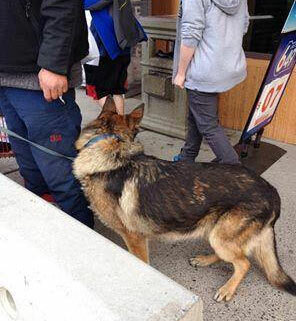 It is alleged that the BC SPCA received many appeals for help for Buddy. 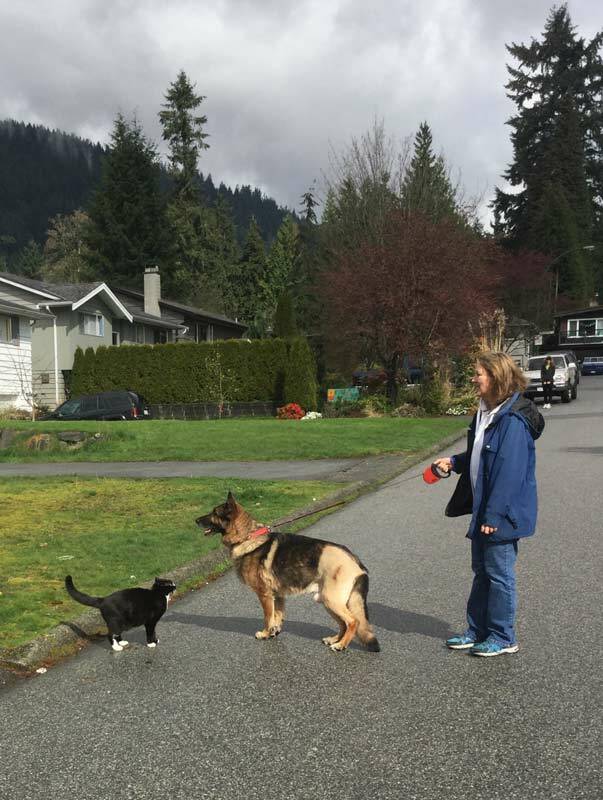 Sometimes the BC SPCA seizes for those reasons – and sometimes not. BC's Prevention of Cruelty to Animals Act permits the seizure by the BC SPCA of animals for a lack of food, water and shelter, and for Buddy's degree of emaciation. But, as always, it was a good thing that Buddy did not end up with the BC SPCA because it too often kills big, unhealthy dogs. 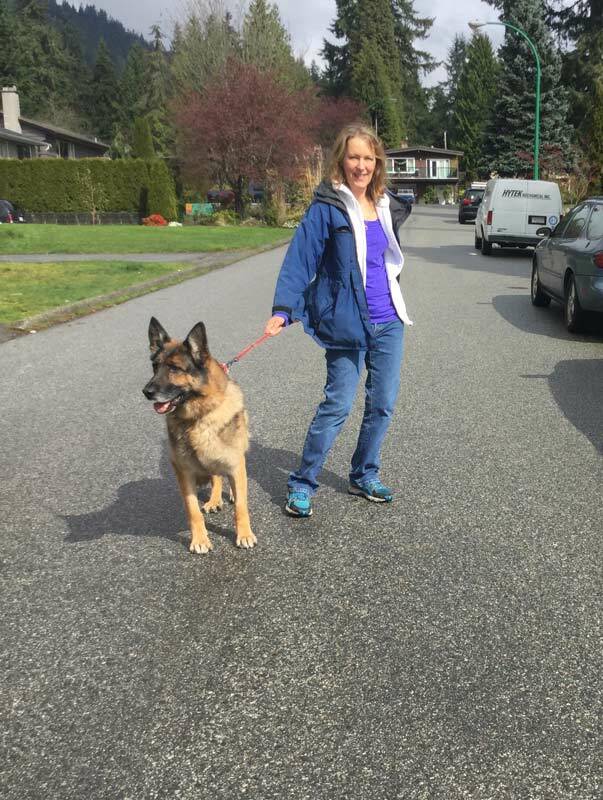 Related stories: Four good dogs killed by the BC SPCA: AAS posts these stories to show the historical context of our ongoing criticism of the BC SPCA. Over the years, our criticisms have resulted in many important animal-welfare improvements made by the SPCA. The women asked Animal Advocates to help rescue Buddy. And we did help- by telling them to offer any amount of money for Buddy. AAS won't bargain for an abused dog's life. And that if they did get Buddy, that AAS would take on all expenses and rehoming. But A.T.D. wouldn't sell. And because of A.T.D. 's frightening behaviour, the women were all afraid to try to rescue Buddy. Then A.T.D. left Kamloops. People believed he was heading to Vancouver on the coast. 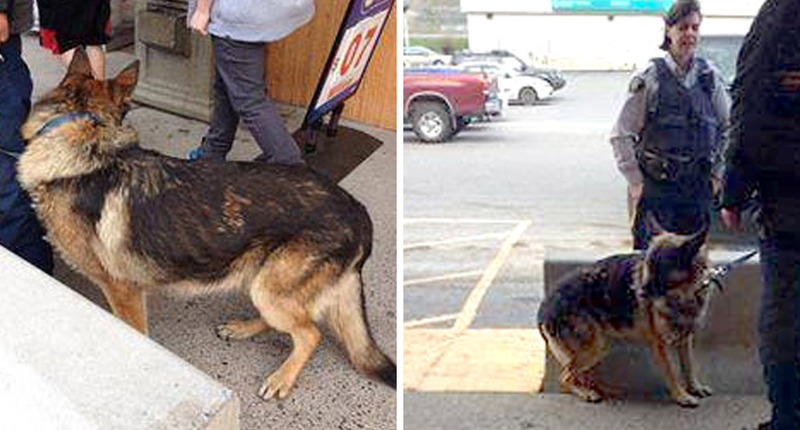 BUDDY'S STORY GETS ALMOST UNBELIEVABLY EXTRAORDINARY! Thanks to Animal Advocates' years of hard work to create a substantial Facebook and internet presence, one of the most remarkable women we have ever met (we will call her J.M. 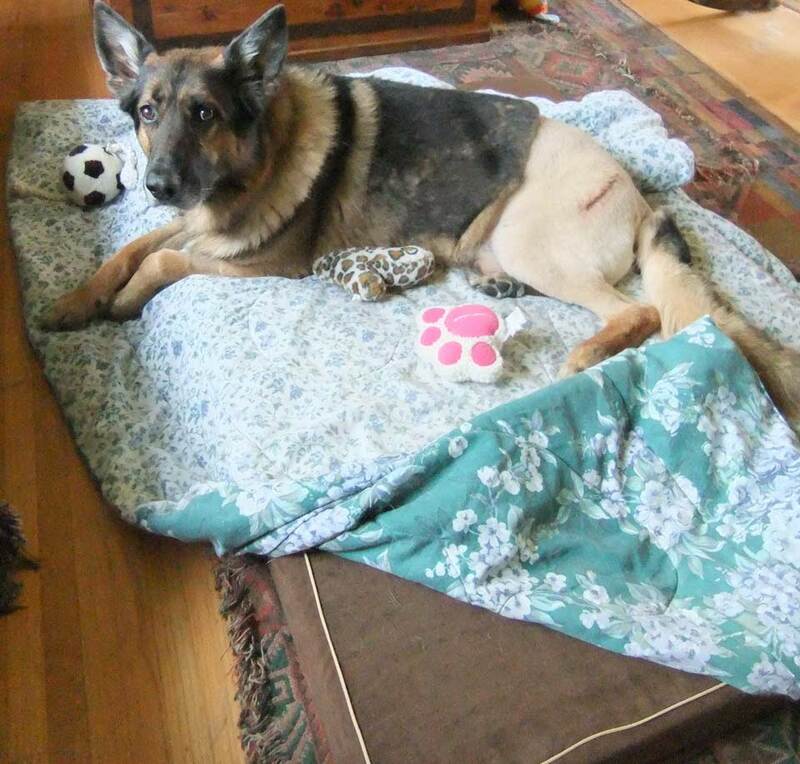 ), who lives far away on Vancouver Island, read AAS's story of Buddy's plight and took immediate and astonishing action. She began phoning every liquor store, motel, pound, and social services office between Kamloops and Vancouver. She tracked A.D.T down to Merritt BC, 55 miles south of Kamloops, where he had ended up in jail and Buddy had ended up in the Merritt pound. A.T.D. had 72 hours to claim Buddy before the pound could give Buddy to a new owner. J.M. had to move fast to be the first to apply for Buddy if A.D.T. didn't claim him. J.M. and her niece jumped in their SUV, took a ferry from Vancouver Island to Vancouver, and drove to Merritt BC, a distance of 220 miles. The women had to stay two nights in a motel before the 72 hours elapsed and they could adopt Buddy from the Merritt pound. Animal Advocates' part in this rescue was to pay all expenses: the gas, the ferry, and the motel. We kept in constant touch. Many tense complications arose (which we are not at liberty to disclose), but AAS assured J.M. of our unwavering backing no matter how long it took or what it cost. We have to say though that J.M. would have carried on regardless – that's the kind of person she is! "Buddy is up early and anxious about his old routine which was to panhandle, pick up cans and bottles, then hit the liquor store as soon as it opened. He also gets anxious around 4pm as that was when A.T.D. would go to the welfare outreach office and get something to eat, providing he was sober enough to go. Too much walking or up and down stairs and his hips ache. He is eating very well now, kibble with homemade stew twice a day plus yogurt and treats. He is coming around but it is still all new and confusing. I actually caught him wagging up a storm today." After a few days AAS was ready to take over Buddy's care in Vancouver. So it was back on the ferry for Buddy and J.M. Buddy was neutered, vaccinated, dewormed, tattooed and microchipped – and we had his hips, knees and spine x-rayed. Sure enough, he had hip displaysia in one hip. Constant travel would have been agony for Buddy, but Buddy never complained and never held back. Hip surgery will be performed by BC's best surgeon even though it may cost up to $7,000. Buddy will get the best that medicine can offer because all AAS dogs are treated just as we would treat our own beloved dogs. Nor will AAS rehome a dog until all that is necessary to do has been done, including the rehabilitation of behaviours that may mean a dog is unwanted. Note: By clicking on each photo you can read more about Buddy. Then press "Esc" on your keyboard to close the image. 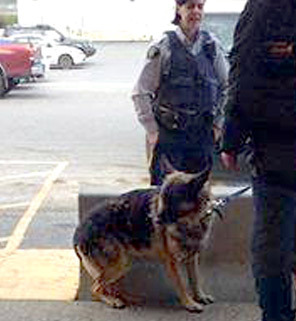 Buddy with the Kamloops RCMP after Buddy was seen running loose and the police were called. Minutes after the photos were taken Buddy's owner reappeared and took Buddy away. Buddy was given a thorough vet exam. The good news was that he didn't have any broken teeth needing extraction. The bad news was that he had hip dysplasia. The vet rated Buddy's body score at 3/5. To be healthy (but not too heavy so that there is no unwarranted strain on his hips), Buddy needs to be 10 lbs heavier. From J.M. : "This is Hannah. 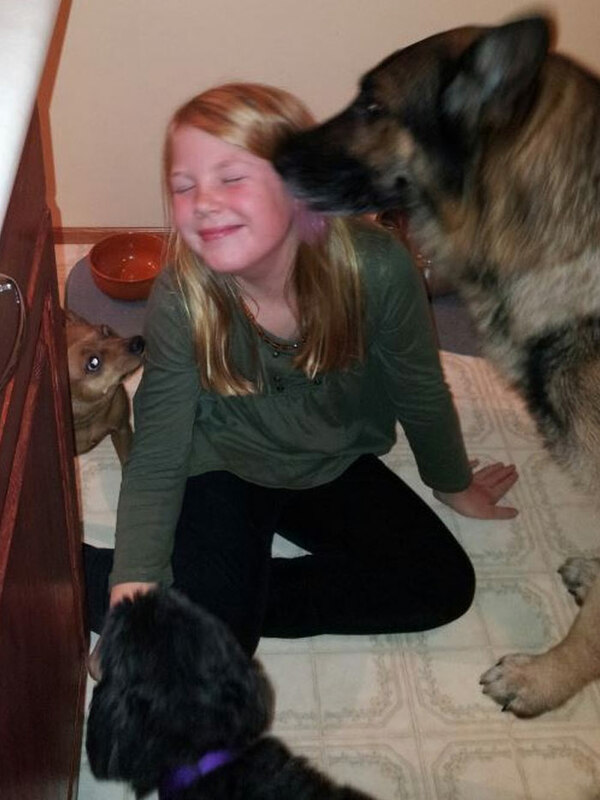 She's our nature girl/animal lover. She was the most excited to meet Buddy. He started following her right away and tried to get up on the couch with her. I couldn't believe how much Buddy kissed her. Her little face was soaked and she was laughing." From J.M. 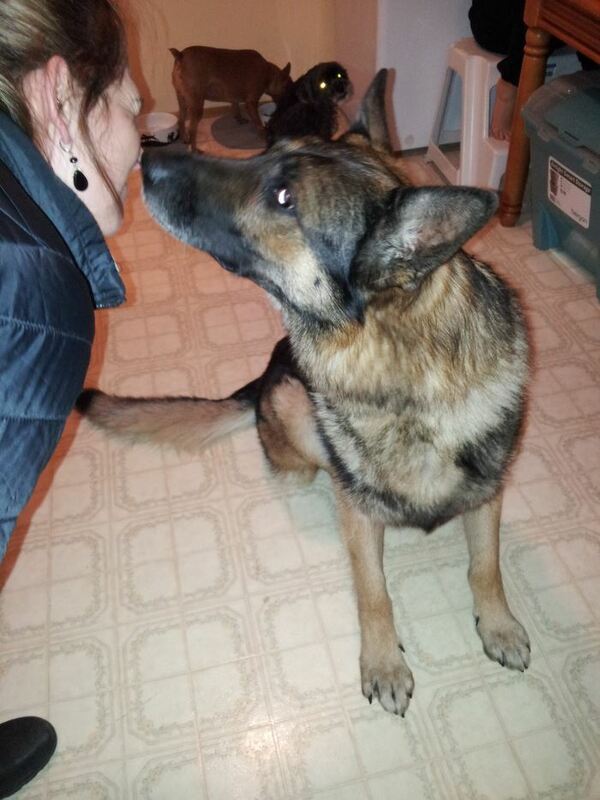 : "My dogs recognized right away that Buddy was a good guy and no threat to them. He has shown no aggression whatsoever. Not with to kids, to dogs, with bones, food or towards anyone while walking. Buddy is one very loving dog." 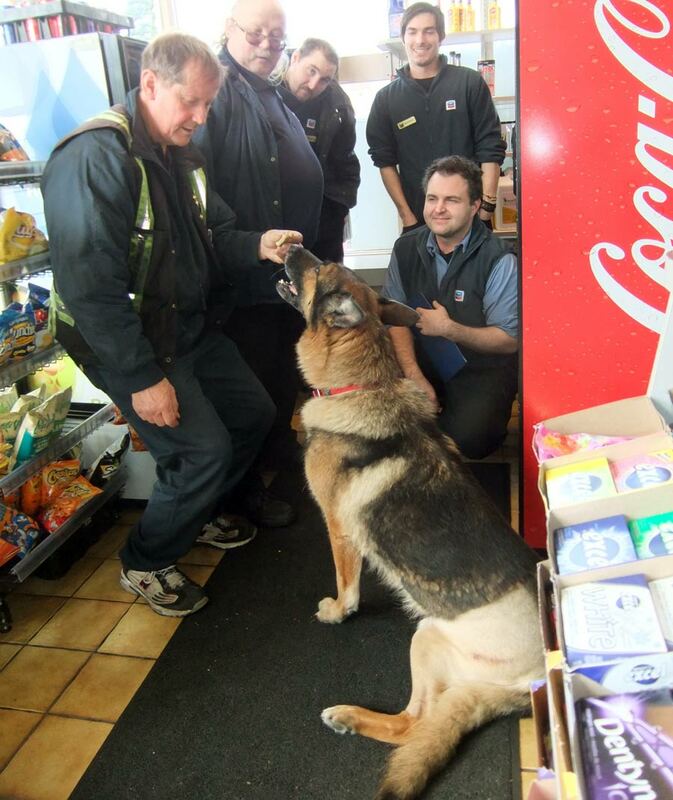 Buddy goes for a walkies to the gas station where Rob gives Buddy a cookie. HOW DID BUDDY END UP IN A.D.T. 's HANDS? Buddy was clearly a well-loved family dog. No one will ever know how he ended up in A.D.T's hands, but Animal Advocates is able to make some guesses based on more than 20 years of rescuing dogs. 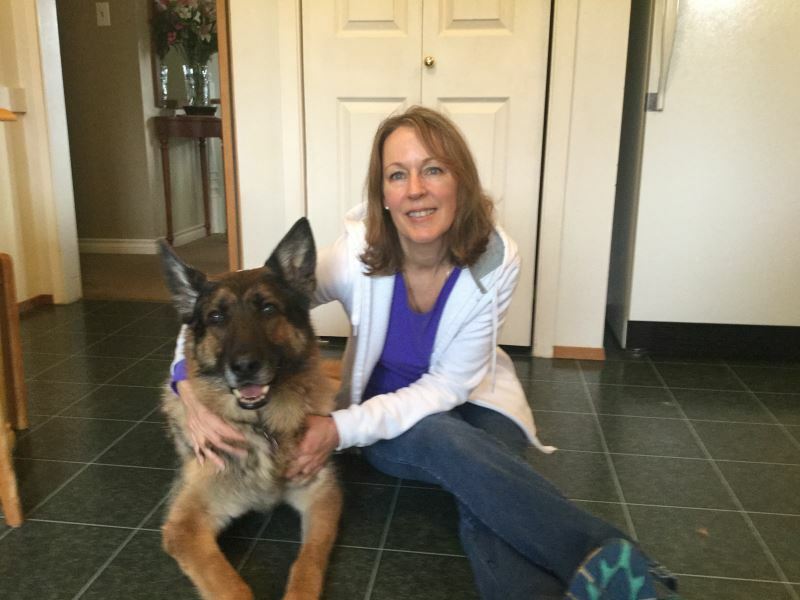 Not uncommonly, a dog like Buddy is often dumped by their "family" at a pound, or humane society, or SPCA, which sells the dog to an abuser or chainer. That these agencies publicly claim to care about their dogs is one more cruel irony inflicted by self-servers onto helpless dogs. These agencies take the money without doing even the cursory home check that would reveal that the dog is going to be abused, perhaps fatally. An internet buyer and seller bought a French Bulldog from the BC SPCA – no homecheck – then offered him for sale on CraigsList to anyone who paid her $1,500. Who sold Hap into a life on a chain? We don't believe that Buddy was physically abused by A.D.T. but we know that Buddy was severely neglected by A.D.T. And though, when in Kamloops, A.D.T. refused to sell Buddy, at some future time A.D.T. may have sold Buddy using the notorious websites Kijiji or CraigsList. Buddy could have ended up being beaten and starved to death as were Captain and Shadow after being bought by Brian Whitlock in Vancouver and by Nicolino Camardi in Calgary, respectively. Animal Advocates and J.M. and all the worried women in Kamloops may have saved Buddy from that terrible fate. JAN 2015 UPDATE - BUDDY GOES TO BRAEMAR ELEMENTARY SCHOOL! Not dog-training school because he is already so well-behaved. Buddy was invited to Braemar School to meet the kids who raised $575.00 for his hip dysplasia surgery. He was perfect! Buddy stood quietly while he was swarmed by gentle hands and friendly faces (some of which he licked). Buddy brought his little friend Itsy to school too! Buddy is doing so well, he's lying at my feet as I write this. He still isn't allowed to walk as far as the village, so I drive him to the gas station for his daily cookie. From left: Rob, Mike, Stan, James, and station owner Roger Zunec. 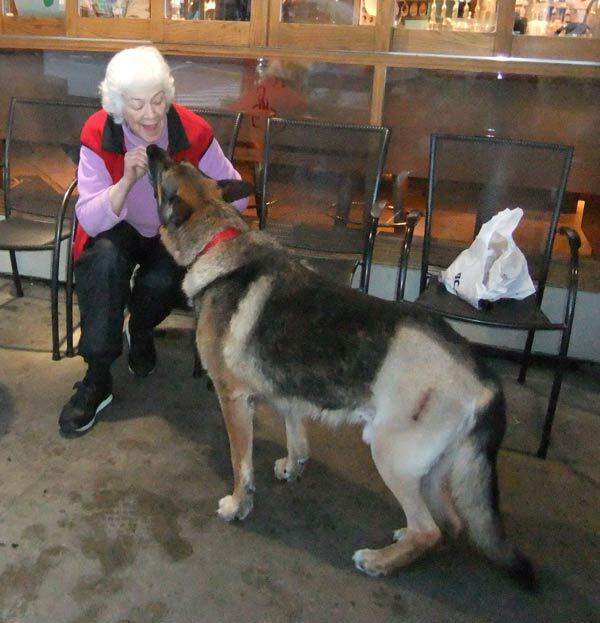 Then we head to Delaney's coffee shop where he gets another treat from Nan. 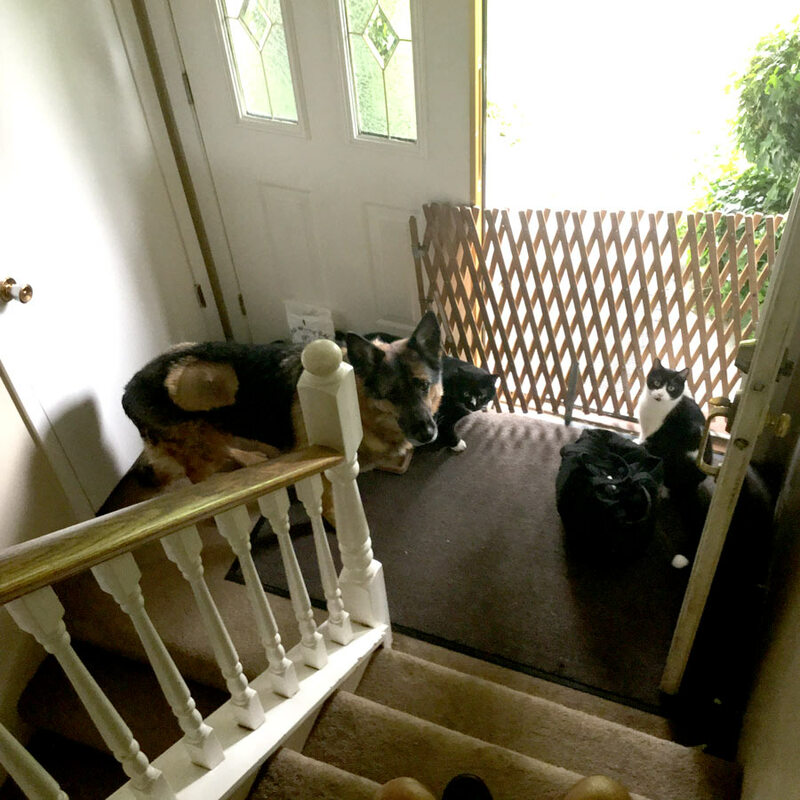 Nan is at Delaney's almost every morning with her two little rescued dogs Goldie and Fluffy. 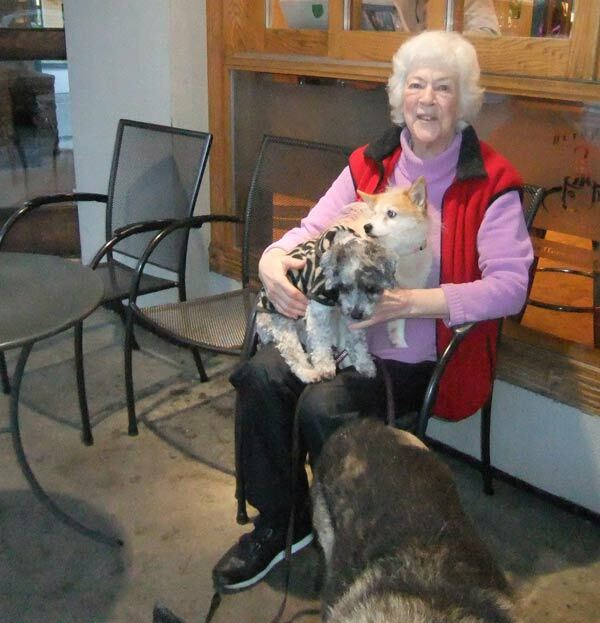 Nan is at Delaney's almost every morning with her two little rescued dogs Goldie and Fluffy. On his memory-foam bed that was generously donated to him. 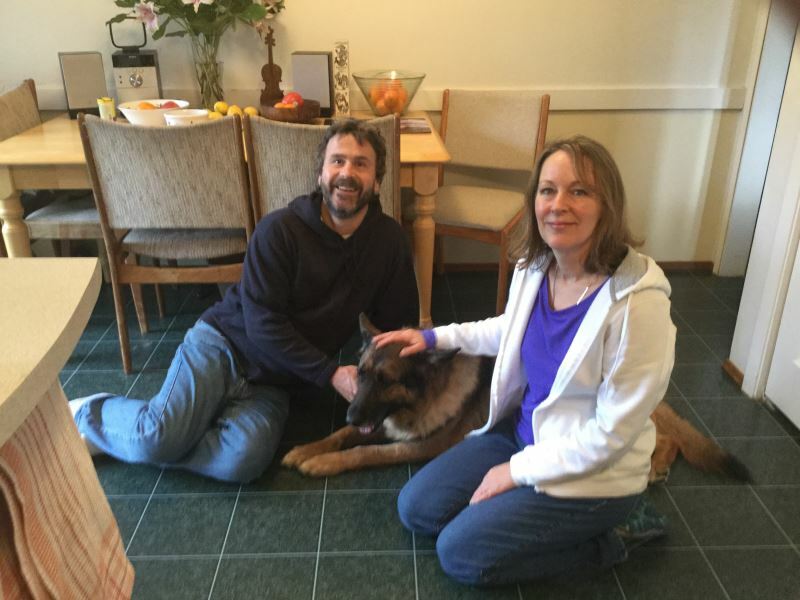 Animal Advocates' good friends Peter and Trish have welcomed Buddy into their family, now that we know that his recovery is complete and the hip is working just as it should. 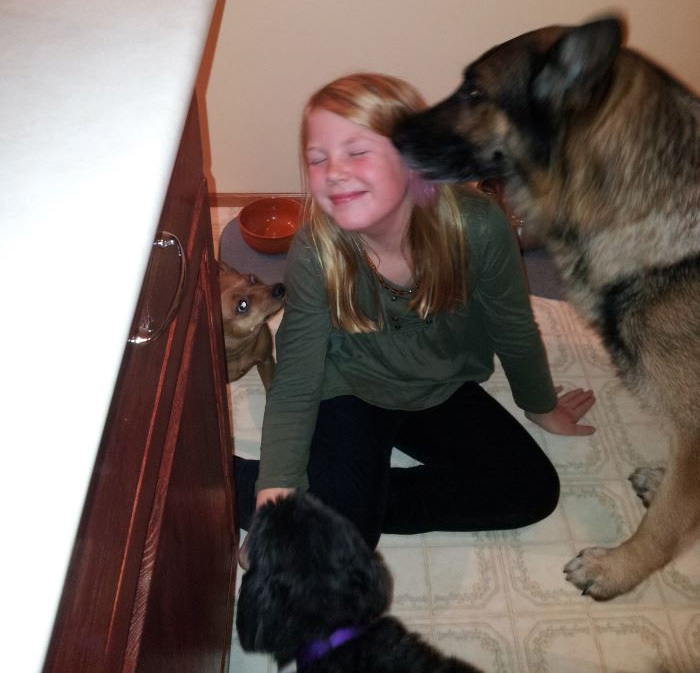 Just a week before we got Buddy, and a year after Shyla, their previous rescued German Shepherd passed away at a ripe old age, Peter and Trish told us that they were ready for a new dog and asked if we would keep an eye out for a Shepherd. 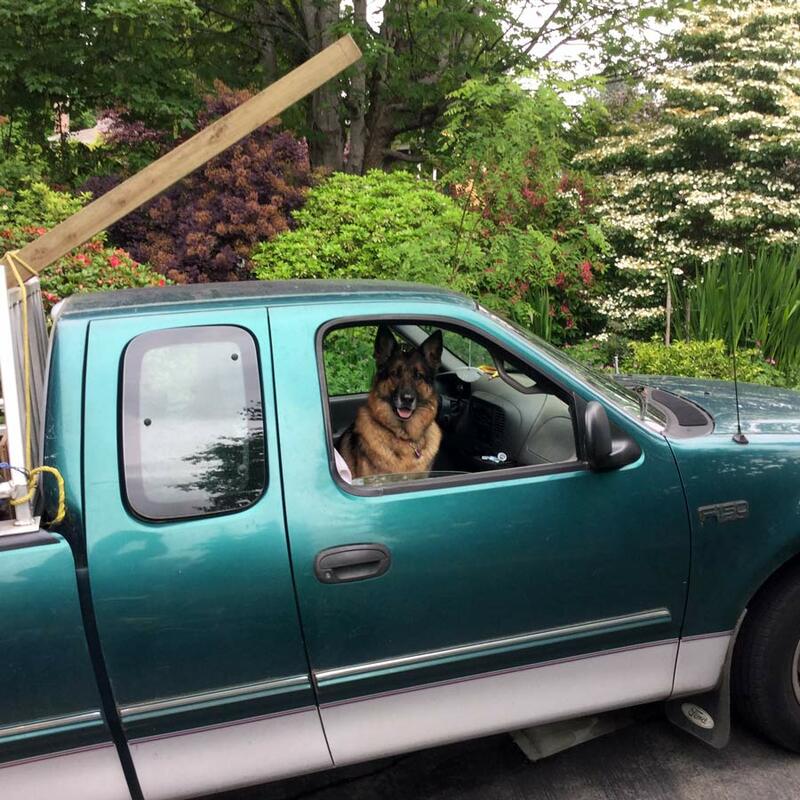 We said, "Are you kidding – WE HAVE your dog!" 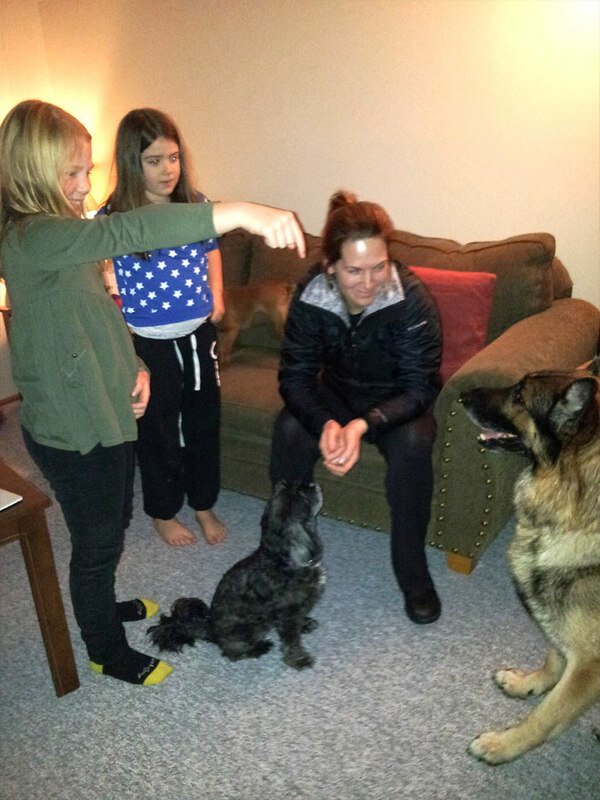 We told them all about Buddy and that they could meet him as soon as we had him in our care. Just like everyone else, they instantly fell in love with him. He's utterly irresistible! Peter is the neighbourhood gardener (the world's best gardener everyone agrees). Buddy will be Peter's "gardening dog", just like Shyla was. Buddy will spend all day with Peter at his jobs, being loved and fussed over by everyone. Buddy will be one of those very lucky dogs who goes to work with Dad, never alone and bored. Buddy's buddy is Fergus the cat, who will be going on walkies with him. It's so lovely to be able to tell you that everything good fell into place for Buddy, and that Peter and Trish, Fergus and Sid, are sharing their home and lives with him. When Buddy can't go with Peter to his gardening jobs, he goes to work with Trish where there are many, many dog-lovers to fuss over him – and be envious that Buddy isn't their dog. He's one of the most wonderfully perfect dogs that it's ever been my privilege to help rescue. Buddy and his buddies Fergus and Sid. "Hurry up Trish. We're ready to go for a walk!" "Hurry up Peter. I am ready to go!" Animal Advocates got such a warm-hearted outpouring of help for Buddy from so many generous people. Every donor made Buddy's happiness possible. I hope you all know how much your generosity meant to us because it's hard to find the words to adequately describe our heart-felt thanks. You all have become friends. Many donors have or had rescued dogs. Like Mango. Mango is being treated for cancer in a wide variety of ways, traditional and alternative. Phil Lambert sent Buddy help from Mango and in memory of Lola. Tim sent state-of-the-art beds. 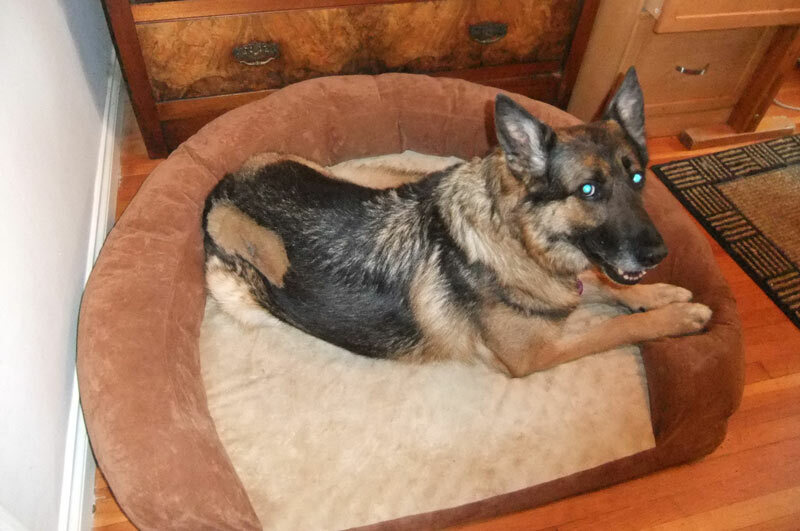 Buddy's best bed, a memory foam bed, went with him to his new home. Poor Buddy had to go through a second surgery. We discovered a lump on his side. A fine-needle aspiration biopsy was inconclusive, so we had to have the lump removed and biopsied. But it was good news – it was only a benign hair follicle tumor. Our expenses for Buddy certainly mounted up, but thanks to Animal Advocates' many generous friends, all the bills got paid promptly.